who practice in the specialty field of animal rehabilitation." New Petition! Show your support today by reading, signing and commenting on the 2018/2019 petition! 2019 PETITION! Click here to show your support! UPDATE: AS OF MAY 25th, 2018. UNFORTUNATELY, the Assembly Appropriations (fiscal committee) held back AB 3013, so this version of the Animal Physical Rehabilitation Bill will not be moving forward during this legislative cycle. But...HAVE NO FEAR! Making laws is a marathon, and we have the endurance that is needed when it comes to improving the quality of life for animals in California! There are important regulations and legislation that the California Veterinary Medical Board and the California Veterinary Medical Association are trying to push through that will strengthen their monopolies on animal healthcare and effectively limit consumer choice. As consumer choice goes down, less animals can get treated and prices could then go up. That's just what happens when monopolies exist. As it is, there are so few practitioners in California that many of the existing practices have long waiting lists. Some senior animals can't wait, and end up getting euthanized because they can't get the care they need to maintain their quality of life. So stay on your toes, and continue to resist and persist. We are stronger together and in it together for the welfare of the animals in California. UPDATE: AS OF APRIL 10th, 2018. GREAT NEWS!!! AB 3013 passed out of its first committee (Assembly Committee on Business and Professions) with a vote of 9-0! There was not a single "no" vote cast against this well crafted bill that serves to increase access to qualified licensed physical therapists trained in animal rehabilitation so more animals can get the care they need. Significant amendments were made by the Assembly Business and Professions Committee to increase safety and provide definitions to clarify the language and to address the oppositions concerns. The author and sponsor accepted all amendments. The bill is on to its next step in the legislative process: The Assembly Appropriations Committee. This is great news! 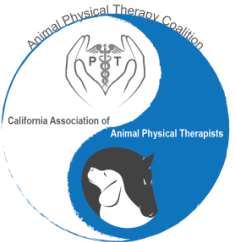 We are pleased to announce that the California Association of Animal Physical Therapists (CAAPT)/Animal Physical Therapy Coalition are sponsoring a legislative bill that will codify the California Veterinary Medical Board's Animal Rehabilitation Task Force language as it relates to Physical Therapists working on animals! If passed this bill would expand health care options for consumers by allowing veterinarians to refer and provide medical clearance for pets to a licensed physical therapist certified in animal rehabilitation who is working on a premises that meets state health and safety standards, as determined by the California Veterinary Medical Board (CVMB). 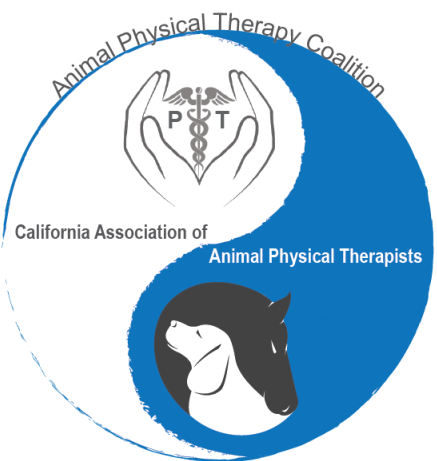 Additional training on animals (determined by the CVMB and Physical Therapy Board of California (PTBC) working collaboratively) would be necessary for the licensed physical therapist to practice under indirect supervision. Such referrals would be authorized only after a veterinarian has conducted a thorough medical examination and determined physical rehabilitation would be a beneficial treatment option. Currently, physical therapists are strictly prohibited to working under the supervision of a veterinarian and only on a veterinary premises. This restriction makes it very difficult to have access to a PT (because a vet would have to hire a PT, and many chose not to hire one if their practice is unable to sustain another doctorate-level professional). There are many PT's that would like to work but are unable to find a job with a veterinarian. What does that mean for the consumer? Less choice and less access to qualified practitioners. This bill will serve to lift the veterinary restraint of trade/monopoly so more consumers can get the care they need for their pet. Ask your California state legislators to support the Animal Physical Rehabilitation Bill--AB 3013. This bill would codify the language that was recommended by the California Veterinary Medical Board's appointed stakeholders Task Force to allow veterinarians to refer pets to a physical therapist certified in animal rehabilitation working on a premises that meets state health and safety standards. Q: What is animal physical rehabilitation? Q: What is the education level of a qualified, licensed physical therapist with additional training in animal rehabilitation? A: To work on humans, current requirements for licensure of a physical therapist in California are the completion of a bachelor’s degree followed by a 3-year clinical doctorate in physical therapy. Following completion of the doctorate, a candidate must then pass both a national and state licensing exam. AB 3013 would require those licensed as physical therapists to undergo animal-specific training to ensure competency in animal specific areas. Qualifying courses would be approved by the Registry of Approved Continuing Education (RACE), a program provided by the American Association of Veterinary State Boards (AAVSB). In addition to coursework, physical therapists would be required to intern with a qualified animal rehabilitation therapist or veterinarian prior to earning their certification to work on animals. All competency training to earn a certificate in animal physical rehabilitation would be determined by the California Veterinary Medical Board and Physical Therapy Board of California, working collaboratively. Q: Why is AB 3013 so important? A: California’s statutes and regulations governing animal physical rehabilitation limit, rather than expand, consumer choices for quality animal rehabilitation. Under existing California law, qualified physical therapists are strictly prohibited from practicing unless they are directly supervised by a veterinarian and restricted to only working on a veterinary premise with a veterinarian onsite. If passed, AB 3013 would allow licensed physical therapists with certification in animal rehabilitation to practice under indirect supervision of a veterinarian after a referral by the veterinarian of record has been made to an animal physical rehabilitation premises. This would expand choices for consumers and attract qualified physical therapists to this growing profession. Q: Who has been demanding access to and choice of qualified rehabilitation practitioners? A: According to a Founding Diplomate of the American College of Veterinary Sports Medicine and Rehabilitation, Janet Van Dyke, DVM, DACVSMR, CCRT, “This is a client-driven industry. The veterinary field is trying to now catch up with their demand for rehabilitation services. Veterinarians recognize that physical therapists bring a skill set to our field that we need. ” Thousands of California consumers have voiced their desire to access qualified physical therapists so they can get the care they need for their animals. Q: Animals can’t say where ‘it hurts’; are physical therapists qualified to work on animals? A: Yes. Licensed physical therapists certified in animal rehabilitation are highly qualified to treat pets, including horses. They have done so for decades and have a demonstrated record of success. To become certified, physical therapists receive training on animal pain recognition, animal behavior, animal handling, comparative animal anatomy and physiology, comparative biomechanics, animal pathology, animal infectious diseases, musculoskeletal imaging, and much more. They learn how to identify red flags for pets who would need to be referred back to their primary veterinarian. All advanced training courses available today to meet the competencies stated above are reviewed and approved by the Registry of Approved Continuing Education (RACE), a program overseen by the American Association of Veterinary State Boards (AAVSB). In addition to coursework, physical therapists are required to intern with a qualified animal rehabilitation therapist or veterinarian prior to earning their certification to work on animals. Details of this additional coursework would be determined by both the CVMB and the Physical Therapy Board of California working collaboratively. Q: As a consumer, how would I know this proposal protects animal safety? A: A few things point to the success and safety of animal rehabilitation provided by licensed physical therapists with advanced training/certification in animal rehabilitation. First, seven states—Colorado, Nevada, Nebraska, New Hampshire, Utah, Oregon, and Virginia—have already adopted indirect supervision models of health care for animal physical rehabilitation. This model allows veterinarians to refer qualified animal patients to trained and certified physical therapists for treatment without mandating that the service be rendered with a veterinarian onsite. Indirect supervision also requires veterinarians to retain control over animal patient care and the animal’s rehabilitation plan, ensuring that they have final say about an animal’s care. Second, after 73+ aggregate years of practice, no consumer complaints or disciplinary actions have been taken against a physical therapist working in a state that operates under an indirect supervision. Instead, the demand for services has grown and animal rehabilitation in states such as Colorado are flourishing as a result. Q: Could a physical therapist practice on my animal without a veterinarian’s approval? A: No. This bill requires consumers to ensure their pet undergoes a thorough physical examination by a veterinarian and receive a medical clearance and referral before it can receive animal physical rehabilitation treatment services. Q: Should I be worried if my licensed physical therapist certified animal rehabilitation works at her or his own business premises, and not at the veterinarian’s office? Will AB 3013 allow animal rehabilitation practice on an unregistered facility? A: No. You should not worry any more than you would about your own physical therapist practicing at his or her facilities. As with our own medical care, when caring for pets it’s important for consumers to take the necessary precautions to educate themselves on the quality of services provided by an individual practitioner. AB 3013 bolsters safety further by permitting licensed physical therapists certified in animal rehabilitation to only operate on premises that meet state health and safety standards determined by the CVMB. The animal physical rehabilitation premises would be subject to inspections by the Board to ensure public safety. Q: Will AB 3013 take away privileges from licensed DVM’s or RVT’s? A: This statute makes no changes to the way RVTs currently practice. It does, however, increase the options for veterinarians looking for qualified therapists to treat their patients. Veterinarians want to be empowered to make choices for their animal patients. The veterinarians should be able to decide. Q: Would AB 3013 increase job opportunities for RVTs and others? A: Yes. RVT’s and others would be able to work under the direct supervision of a qualified physical therapist. Q: My veterinarian has a physical therapist working on her premises; would this prevent me from obtaining physical rehabilitation services at her location? A: No. This bill expands consumer choice; it does not restrict choice. You would still be able to receive animal physical rehabilitation on a veterinarian’s premises if offered. In the event that animal rehabilitation services are not provided at your veterinarian’s office, you could seek treatment by a licensed physical therapist certified in animal rehabilitation who is working at an animal physical rehabilitation facility that meets health and safety standards or in a mobile setting with oversight by the CVMB. Q: Will a veterinarian who makes a referral to a qualified physical therapist be liable for what happens in their care? A: No. In response to the concern expressed by the Veterinary Medical Board, AB 3013 shifts the liability off of the referring veterinarian and onto the treating physical therapist certified in animal rehabilitation. Q: Why does the California Veterinary Medical Association (CVMA) and National Veterinary Technician Association (NAVTA) oppose AB 3013? A: The CVMA and NAVTA are trade associations organized to protect the interests of veterinarians and veterinary technicians respectively. They are accustomed to hierarchal control over pet health care. Animal health care has been slow to shift toward the delivery of collaborative health care services among allied professionals and this has led to a reduction in consumer choices. Keep in mind, it is unrealistic to think that consumers and pets can get 100% of their health care needs met at their local veterinarian’s office. Instead, California consumers should be provided opportunities to access a broader array of qualified animal health care options, including animal physical rehabilitation, just as they are able to do for their own health care. False: AB 3013 grants individuals with a license in physical therapy and a certificate in animal rehabilitation the ability to practice under INDIRECT supervision of a veterinarian and only after a referral has been made. National research conducted through state board authorities has shown that this model does not compromise the protection of pet owners and animal patient care. This model is safe. False: Again, AB 3013 grants individuals with a license in physical therapy and a certificate in animal rehabilitation the ability to practice under INDIRECT supervision of a veterinarian and only after a referral has been made. False: Under AB 3013, RVTs may work under the direct supervision of a physical therapist certified in animal rehabilitation. Furthermore, this ‘specialty’ does not yet exist for RVT’s. This is a ‘proposed specialty’ for technicians and not widely or formally accepted by those in the veterinary field. False: Under AB 3013, RVTs may work under the direct supervision of a physical therapist certified in animal rehabilitation. 1. AB 3013 will “allow physical therapists to operate independent practices by referral only”. False: AB 3013 clearly states that PT’s would operate under INDIRECT supervision. They would not be practicing independently. False: AB 3013 clearly states that a veterinary-client-patient-relationship would need to be established by a referring veterinarian who has conducted a medical exam prior to referring for AR. 3. AB 3013 would allow physical therapists to treat animals by referral and outside a veterinary practice setting. False: AB 3013 clearly states that a new premise type is created, namely an “animal physical rehabilitation” facility that would need to be registered with the Veterinary Medical Board. The Board would then have the authority to inspect the premises for another layer of consumer protection. 4. AB 3013 would allow animal rehabilitation to be performed in a facility that does not include a veterinary supervisor or require a veterinary licensee manager to hold a premise permit. CVMA neglects to mention that a premise permit, called an Animal Physical Rehabilitation premise permit, would be required by a qualified licensed physical therapist with a certification in animal rehabilitation to provide proper oversight and allow for inspections by the Veterinary Medical Board to ensure consumer protection and animal safety. The CVMA also contends that AB 3013 would amend the Physical Therapy Practice Act to include animals. The bill was recently amended to only make changes to the Veterinary Medicine Practice Act. The Veterinary Medical Board decided to REJECT the common-sense language pertaining to licensed physical therapists certified in canine rehabilitation as offered by their Animal Rehabilitation Task Force at their April 13 meeting. They decided to change the language from allowing the veterinarian to decide the level of supervision to mandating DIRECT supervision of these qualified practitioners and only allowing them to practice on a veterinary premise. Yes, it appears that they defaulted to wanting to pursue their agenda which would monopolize the veterinary profession despite having their OWN Task Force recommend a much more common-sense approach to allow for consumer choice and access by way of creating a legislative fix. Should they continue to pursue their own language, the monopolization will result in shutting down successful practices providing quality care to animals in communities around California. Interestingly, they thought it made sense to allow any unlicensed veterinary assistant without ANY training at all to practice under direct supervision, but if you are a licensed physical therapist, they want to mandate that the physical therapist has to have additional training to work under the same provision. With this kind of conclusion, there may just be special financial interests driving the decisions rather than consumer interests. Stay tuned! Passing regulations and legislation is a marathon, so stay informed and stay active. Together we will continue to march forward to make meaningful change in the best interest of the CONSUMER rather than the veterinarians.